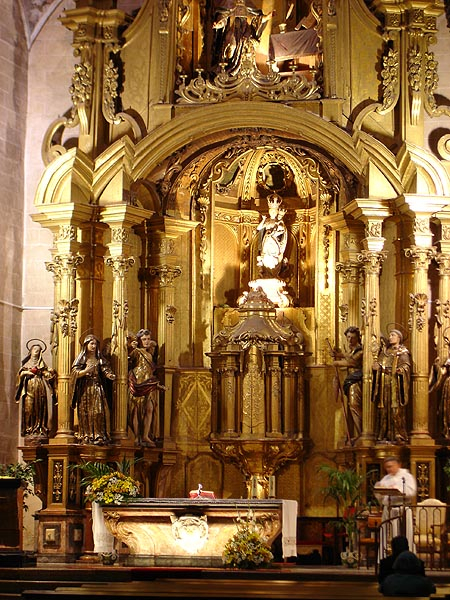 The large 3 manual organ of the Augustinian church in Palma was built by the brothers Damian and Sebastian Caimari, members of the prominent Mallorcan organbuilding family active through 17th and 18th century. 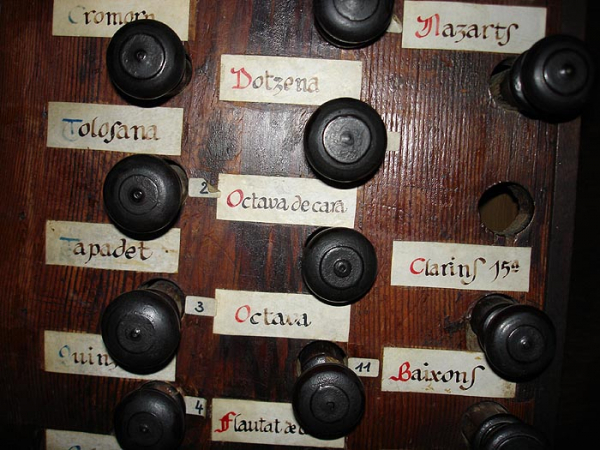 The organ built for the Mallorcan Augustinians is their largest and best preserved opus. 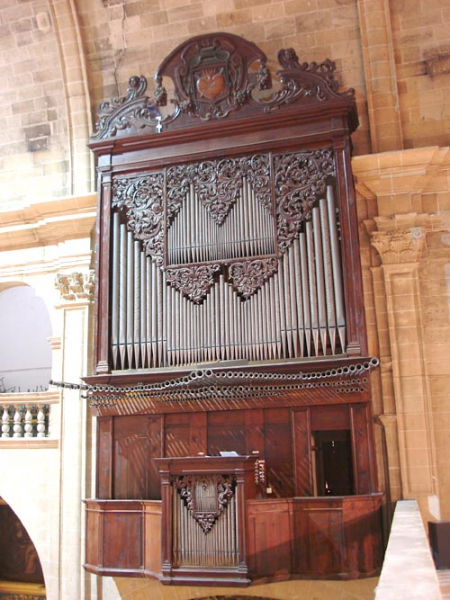 It is credited as the only 3-manual organ which remained in its original historical form not only on the Mallorca itself but on the whole Iberian penisula. I found this to be rather difficult to believe, but the authority of G. Grenzig, who holds this opinion, is beyond any question. 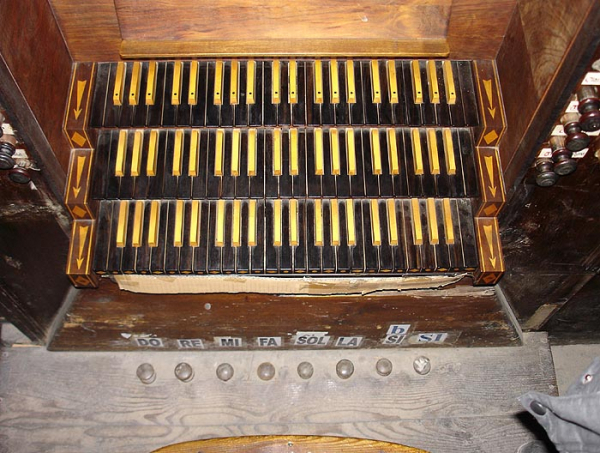 There is hardly any other person who knows that much about the Spanish organs. In 1669, Augustinians finished the building of the new monastery in the city of Palma, embelished their new church with splendid decorations which may still be adored, the most important of them being the 15th century sculpture of the Virgin Mary, 136 cm tall, made entirely from alabaster. Now, it was the time to provide a new organ. The contract between the abbot of the monastery and the organbuilders was signed on 12th July 1702 and the work was finished one and half years later, probably on the 13th November 1703. The swallow's nest type instrument hangs on the right wall of the church, suspended high in the air. Its facade is composed of embossed pipes, the sign of an unusually rich disposition. It is composed of two symmetrical flats with the largest pipes positioned on the sides. 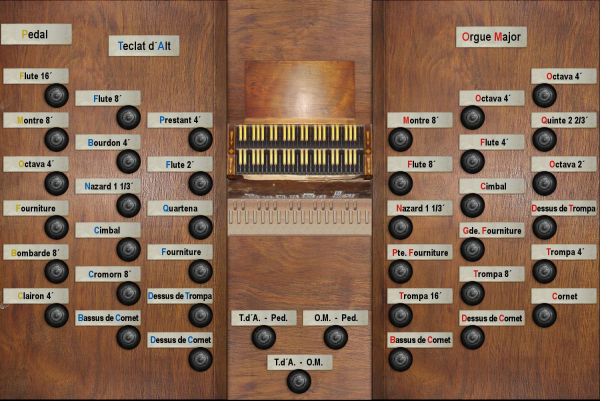 The smaller flat of the positive (Cadireta; Chair organ) is the miniature of the larger flat which comprises the Great organ (Orgue Major) and the Echo division (Orgue d'alt; Oberwerk) placed above the Great organ, actually between the largest pipes of the Great Organ facade. 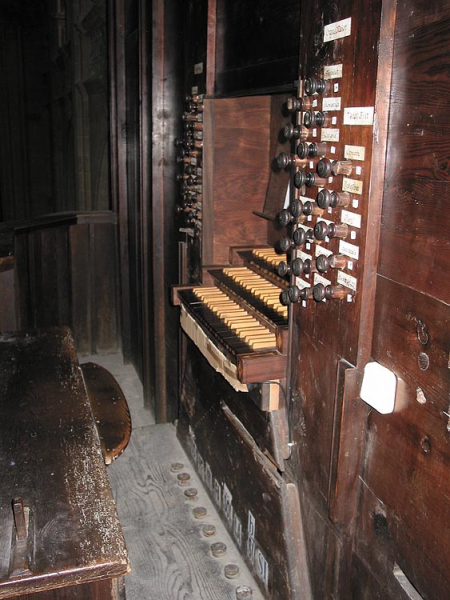 A very unusal feature of the instrument is to be noticed here, we find two base Flautats (Principals 8') on the Great organ, one is positioned on the left, the other on the right side of the symmetrical flat which produces an unexpected stereo effect: one Principal 8' is heard coming from the left, the sound of the second Principal 8' comes from the right! The Octave is also doubled. The Principal chorus is then built further up with multi-rank aliquots: Dozena (2 2/3), Quinzena (2), Alemanya (1 1/3), Simbalet (1/3). The multiple rank cornets Nasardos, Tolosana, Cornetila are present for solistic purposes or - in modern usage - to reinforce the horizontal trumpets, which were added a few decades later, probably in 1755. 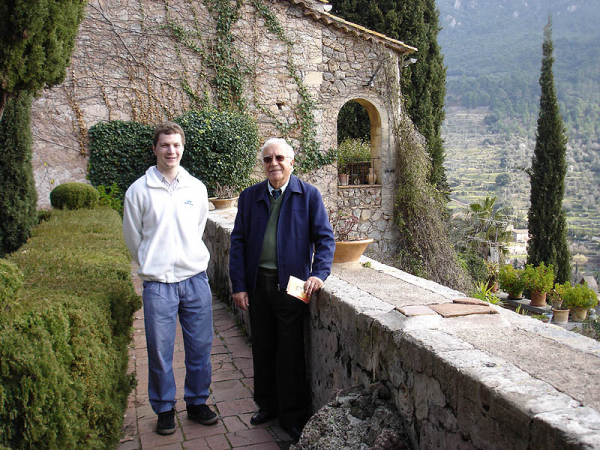 Jordi Bosch was believed to be the author of the Trompeteria, but he would have been too young at that time. Some scholars suggest Gabriel Thomás instead, because of the similarities with his other works. 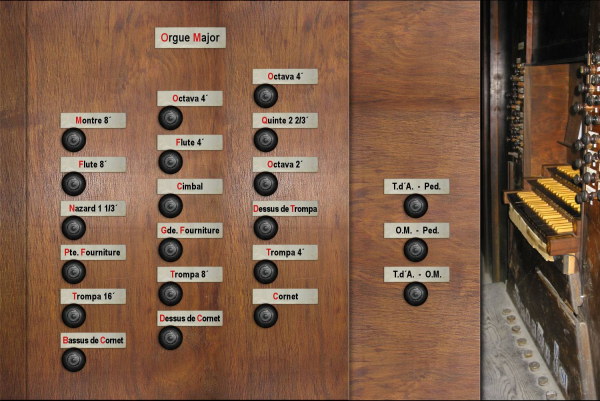 The upper division (Orgue d'alt; Oberwerk) is meant to contrast with the Great organ providing an "echo" effect. But it can be used as well as a solo division thanks to rich Cromorn and Tolosana (cornet). 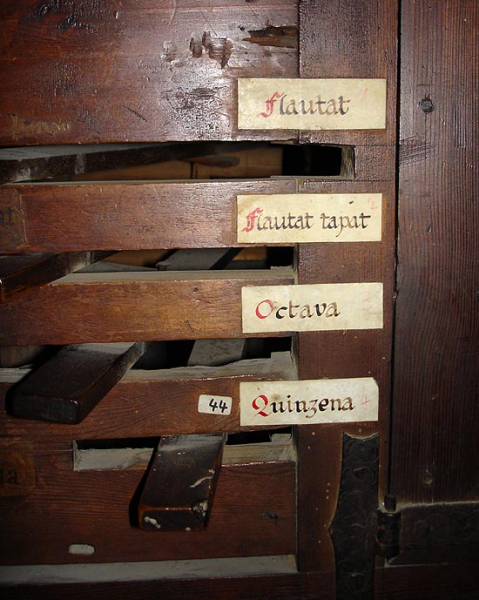 The chair organ (Cadireta; Rueckpositiv) is based on the 4' Flautat and most probably its use is solistic (Nazard) or to dialogue with the other divisions. The organ was luckily spared from various rebuilds during the course of its life and we have therefore the chance to admire it in its very original form. 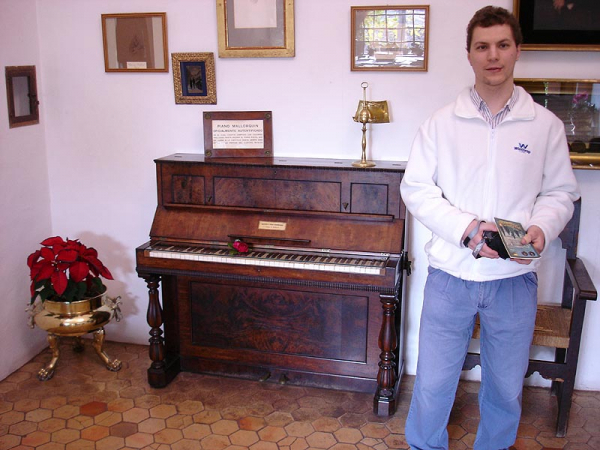 Gerhard Grenzig's restoration in 1969-1970 respected all the original features of the instrument. The instrument is well maintained and concerts are often given. 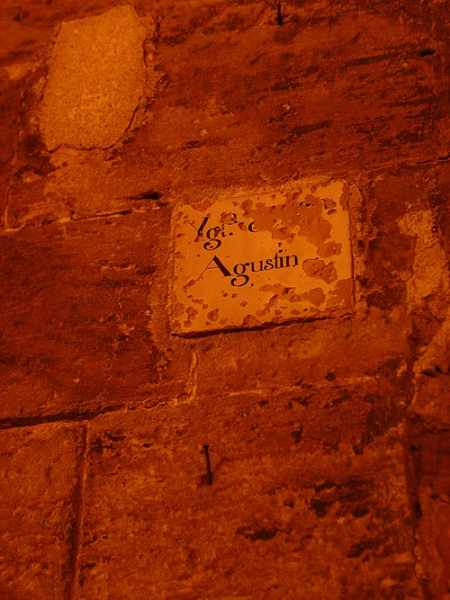 Special thanks to the authorities of the Augustinian convent, especially to Don Baltasare Ramis who gave us full support during the recording process! 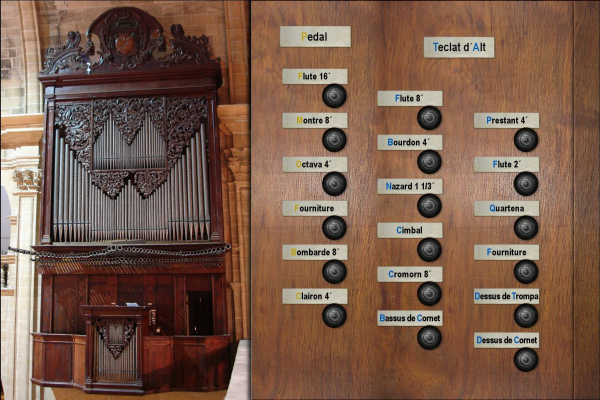 Stuart Frankel: A comparison between the Palma and the Santanyí organs, on-line article. 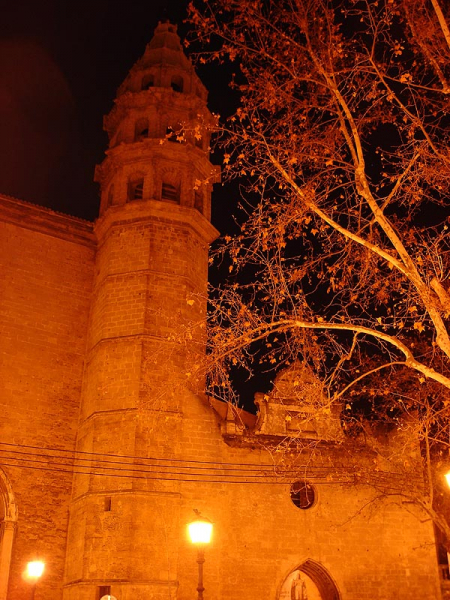 A Mulet - A. Reynés: Orgues de Mallorca. Palma: Olaneta, 2001. F. C. Moreno: Iglesia de Ntra. Sra. del Socorro. Madrid: Escurialenses, 1998.
a 3-manual, historical Spanish organ, the only Spanish organ preserved in its original form including the short octave on the whole Iberian penisula! Great Organ (Organo mayor) with full and rich Principal chorus as well as cornets and typical Spanish Trompeteria (horizontal Trumpets chorus). Positiv (Cadireta) with solo stops as well as with a small Principal chorus used to contrast the Organo mayor. Récit (Teclat d'Alt) with a solo Cromorn, Cornet and Flutes, also having a smaller Principal chorus providing an "echo" to the Organo mayor. a not too wet sample set (sometimes called "moist" sounding, not wet, not dry, but something in between) - the intensity level of the reverberation is rather low, though original. available in 24bit / 48kHz resolution. the Palma St. Agusti organ tuning chart added to the temperament folder of Hauptwerk to be used in conjunction with this sample set. The temperament is equal with an a = 408 Hz. 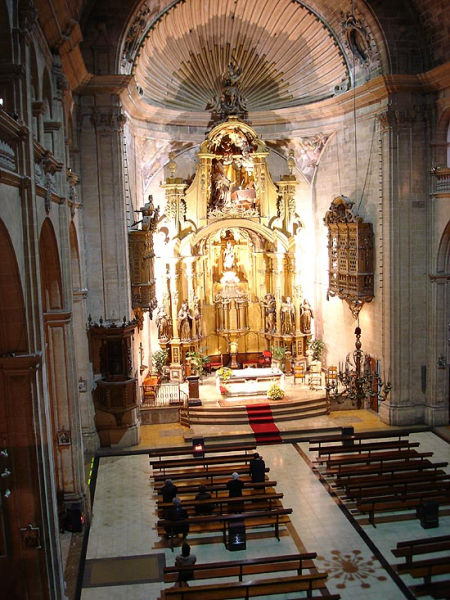 The extended version of the sample set makes the organ look more "standard European" allowing so for other organ music styles, not just early Spanish music. 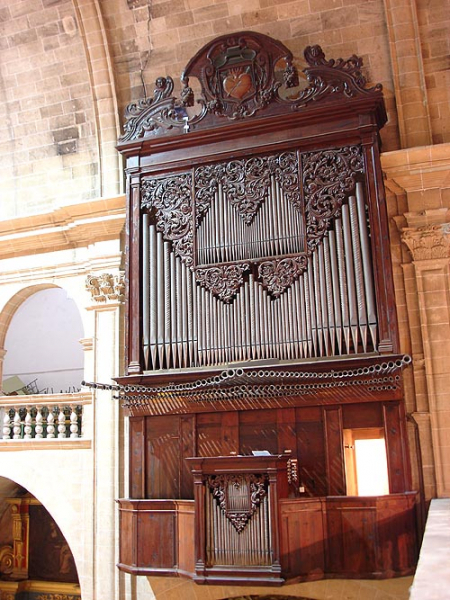 Besides the original Spanish layout of the instrument, another ODF is supplied where the specification and the layout of the instrument was changed to a "standard" organ shape. Version 2: multiple releases support (three levels), dual touch LCD support added. Voicing retouched. In addition to the original version, there is also an extended or standardized version of the sample set. Flautat de cara [Principal 8'] Its decorated pipes are located in the Facade on the right side. Flautat doble [a second Principal 8', 2 or 3 ranks in discant part!] - may be detuned in Hauptwerk to produce a Voce umana beating stop. It is to be found in the Facade on the left side. Palma ODF v. 2.01 (Standardized): the Pedal compass extended to 30 keys (since it was only one octave originally).